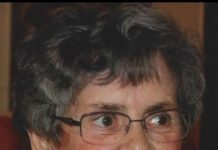 Grafton – Stephanie C. Fenneuf, 71, of Grafton, passed away Dec. 17, 2018 at Care One at Millbury. She was the wife of Roy T. Fenneuf. Born in Worcester, she was the daughter of the late Edward and Stephanie (Baranauskas) Lettic. She was raised in Millbury and attended Sacred Heart School in Worcester and was a graduate of Millbury High School. Stephanie was employed as a secretary for National Grid prior to her retirement. She was a communicant of St. Mary’s Church in North Grafton and had been a resident of Grafton for 39 years. In addition to her husband, she is survived by two sisters, Nancy Forryan and her husband John of Westborough and Patricia Ann Lynch of California; a niece, Stephanie Forryan; and a nephew, John Thomas Forryan III. Her funeral Mass will be celebrated Thursday, Dec. 20, at 11 a.m., in St. Mary’s Church, 17 Waterville St., North Grafton. Burial will follow in Worcester County Memorial Park of Paxton. There are no calling hours.